The lesson learnt from this is that before you diss someone, always check your spellings because someone might be patiently waiting somewhere to reciprocate your action(s). Below is a word battle among Tbo Touch, Contra Bonos and Shane Ngwenya. It all started when Tbo made mockery of men who still drive their fathers' cars. 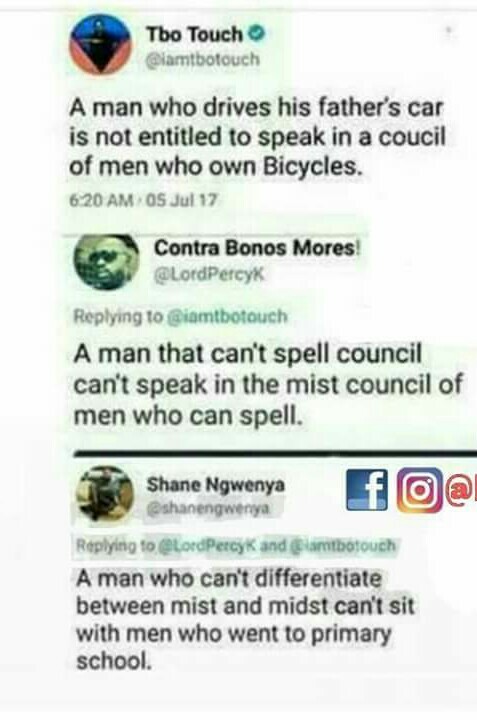 According to him, such men are "not entitled to speak in a coucil of men who own Bicycles". He made his point without noticing that the word "council" wasn't properly spelt. He omitted the letter "n". 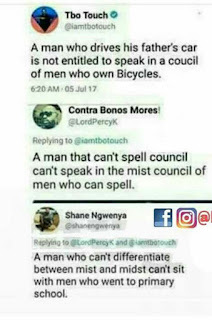 Instead of council, he spelt "coucil". Contra who was perhaps angry with Tbo for making such statement, had to slam Tbo, using his spelling error as a reference point. Lol! While slamming Tbo, Contra committed the same error Tbo committed. Instead of midst, he spelt "mist", and Shane had to fire Contra for that. Shane was careful enough not to make the same error. I really love the replies. These might be typographical errors but nobody would want to understand that, especially when your comments or tweets fail to please most persons. What is your take on this? Are they errors made out of ignorance or are they typographical errors? Most typographical errors are just act of laziness to make the corrections, for some, the use of shortened words for example "Love" they use "Luv". I realized that people who shorten words really find it difficult spelling words correctly so they tend not to know the right word to even correct themselves when they are wrong. Typographical error may be the cause. The person that wrote mist instead of midst may not know the correct word. Coucil instead of Council, to me is a Typographical error. I only suggest we go through our typed whatever for editing before we click the send button.